Financial support alone is not enough to get students through school. 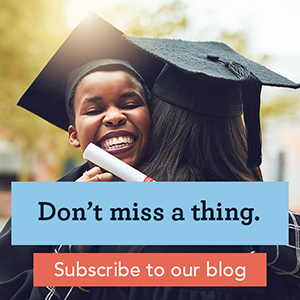 This is nothing new; research has proven time and time again that often more barriers emerge once a student has started to pursue their education, even if they have adequate financial aid to pay tuition. Food insecurity and homelessness are common struggles, and simply feeling out of place can often lead to burnout. While additional grants and food pantries can help alleviate some of these stresses, it can be more difficult to address abstract needs like belonging and connection. That’s where mentors can make a huge difference. Students who make significant connections with their peers, staff and faculty are more likely to thrive, both academically and professionally. College mentors can establish these important connections by guiding personal and professional development and helping students access the resources they need. A Gallup study found students with a mentor had higher job satisfaction after college, and were twice as likely to be engaged at work. The true value of mentorship lies in the life skills cultivated through the relationship. Despite indications that mentorship aids retention and creates more successful graduates, many academic institutions do not believe they have the resources or bandwidth to execute a successful mentorship program. Thankfully, Scholarship America and other student support organizations are looking for ways to pair financial aid with mentorship solutions. We believe in assisting the student’s entire journey, placing them in situations where they can thrive as learners and professionals. Volunteer organizations like our Dollars for Scholars chapters can be invaluable providers of mentoring—and so can you. The great part about mentorship is that it is fundamentally a relationship between two people, which means students don’t have to have access to organized programing to reap the benefits. Students who recognize the value of a mentor can pursue and cultivate career mentors in a variety of different ways. The following are helpful tips for both students and mentors to consider when doing mentorship without programmatic structures. The responsibility for initiating a mentorship relationship usually falls on the mentee even when there is a program in place. This is because, like all relationships, there must be a level of interest. A mentor wants to know that their mentee is eager to learn, and the best way for the mentee to demonstrate that is by taking the initiative and developing the relationship. If you’re interested in mentoring a student, there are a few things you can do to make sure potential mentees can find you. Your college or university’s alumni association is a great way to connect with potential mentees; students can access this network through career services or the alumni office. It’s a good idea for students to pursue a mentor who is currently working in their field of study. Through the relationship the mentee will gain exposure and insight to the profession. While you may use LinkedIn for networking and job hunting, it’s also a powerful tool to connect mentees with mentors in their field. If you’re interested, make sure your profile clearly lists your company, position and willingness to mentor. Once a mentor has agreed to work with a mentee, it is a good idea to have a conversation about what each person expects. This is especially important when there isn’t a program guiding or framing the objectives of the relationship. Mentorship can take many forms and the relationship is as unique as the two people involved, so clear communication is important. At the beginning the mentor and mentee should agree upon a cadence for how often and how long meetings will happen and the best modes of communication between meetings. A major responsibility of the mentee is to figure out what they are hoping to learn from their mentor. The mentor can guide this conversation by helping the mentee develop learning objectives that will provide structure for their time together. It may also be helpful for each person to communicate how they best learn and receive feedback. Maybe a mentee loves to read, and would love to work through a book the mentor has found helpful for their career. Maybe the mentor would love to hear the mentee’s insight about ways to improve the workplace for younger employees. Mentorship is both a professional and personal relationship, but there may be certain things someone may not wish to talk about. For example, a mentee may only want career advice, so therefore asking about their diet and exercise would feel like an intrusion of privacy. Meanwhile, another person may be open to discussing how their personal life affects their work performance. It is important to meet people where they are, and set those expectations early. Especially in long term mentoring situations, the relationship will evolve over time. Learning objectives will change as the mentee develops new competencies or becomes interested in other subjects or skills. It is important to assess these objectives frequently to see if the mentor and mentee still believe these are the appropriate goals. These are fun conversations to have as they are often filled with celebration over accomplishments. At other times, values and objectives will shift because of failure or negative experience. These conversations are less fun, but , regardless of the circumstances, they’re still an important way to emphasize the growth that happens when we learn something new—and our ability to overcome obstacles. As trust grows, it’s natural for mentors and mentees to become more willing to talk about subjects previously off the table (or something happens that makes talking about them unavoidable). Again, as in all relationships, maintain clear communication over when and why these dynamic shifts are happening. Maybe a mentor feels they need to address the mentee because they notice concerning changes in behavior. On the other hand, maybe the mentee finds that meeting weekly is too stressful during the latter part of the semester, and would like to meet every other week. If the mentor and mentee were honest when they were setting expectations, they should already have clarity about how to address conflict between themselves. Always remember to base conflict in caring and try to look for solutions, verses blaming the other person. Institutionally run mentorship programs may remove the barriers to finding a mentor and provide pre-established objectives and guidelines. Conflict is never avoidable, but good communication can turn it into a further learning opportunity. No matter whether it’s formal, informal, institutional or independent, students who proactively navigate and commit to mentorship will reap the personal, social, and professional benefits.